A renovated Deluxe Suite at the new-look Vibe Hotel Sydney. 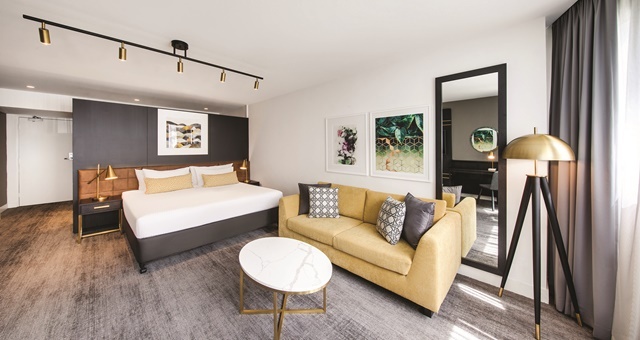 Vibe Hotel Sydney has become the latest beneficiary of the brand’s relaunched style and design, officially unveiling its new look now available to be enjoyed by guests. Headlined by the popular new Storehouse dining concept, the hotel has rolled out a new blue and yellow colour scheme along with natural timbers as a heightened sense for the four-star brand. It marks the rollout of the 2015 relaunch of the Vibe brand to the Goulburn Street property. A full renovation has been carried out on all 198 rooms and suites, with space being a key motivator and furniture designed to not be intrusive to a guest’s movement around the room. Works have also been completed on the hotel’s Master Suite and Family Rooms. All guest accommodations now offer a coffee pod machine, 55-inch televisions and access to 24-hour in-room dining. All work was carried out collaboratively between TFE Hotels’ in-house design studio and interior designer Des-signer. Storehouse Sydney Central is the brand’s second restaurant to be rolled out following the renovation and reopening of the Vibe Rushcutters Bay in Sydney’s eastern suburbs. Australian floral murals on the walls were designed and applied by Apparition Media. New bedrooms adopt a more open-plan configuration. Improvement works have also been applied to guest facilities including the rooftop swimming pool – which retains its views over the Sydney skyline – fitness centre and conferencing spaces. 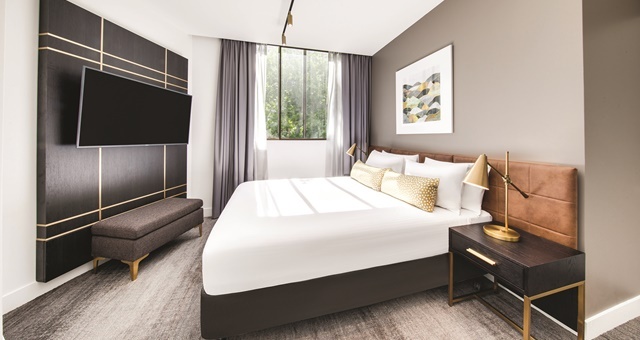 TFE Hotels Chairman, Allan Vidor, said Vibe Hotel Sydney was positioned in one of the city’s liveliest city precincts.